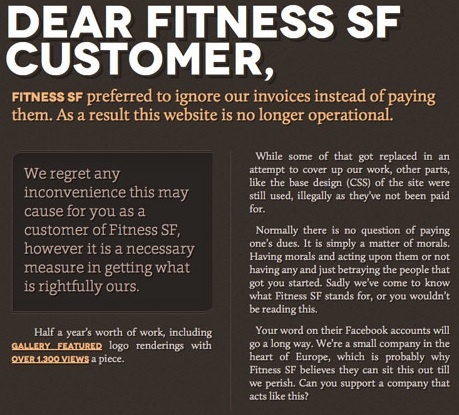 Fitness SF preferred to ignore our invoices instead of paying them. As a result this website is no longer operational. We regret any inconvenience this may cause for you as a customer of Fitness SF, however it is a necessary measure in getting what is rightfully ours. Half a year's worth of work, including gallery featured logo renderings with over 1,300 views a piece. While some of that got replaced in an attempt to cover up our work, other parts, like the base design (CSS) of the site were still used, illegally as they've not been paid for. Normally there is no question of paying one's dues. It is simply a matter of morals. Having morals and acting upon them or not having any and just betraying the people that got you started. 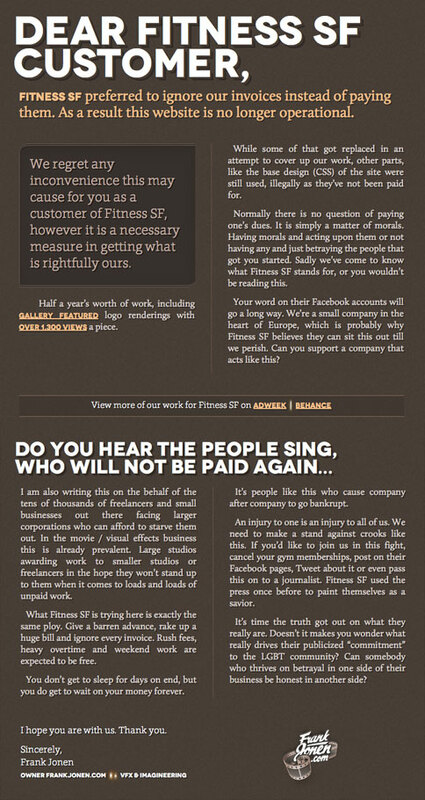 Sadly we've come to know what Fitness SF stands for, or you wouldn't be reading this. Your word on their Facebook accounts will go a long way. We're a small company in the heart of Europe, which is probably why Fitness SF believes they can sit this out till we perish. Can you support a company that acts like this? I am also writing this on the behalf of the tens of thousands of freelancers and small businesses out there facing larger corporations who can afford to starve them out. In the movie / visual effects business this is already prevalent. Large studios awarding work to smaller studios or freelancers in the hope they won't stand up to them when it comes to loads and loads of unpaid work. What Fitness SF is trying here is exactly the same ploy. Give a barren advance, rake up a huge bill and ignore every invoice. Rush fees, heavy overtime and weekend work are expected to be free. You don't get to sleep for days on end, but you do get to wait on your money forever. It's people like this who cause company after company to go bankrupt. An injury to one is an injury to all of us. We need to make a stand against crooks like this. If you'd like to join us in this fight, cancel your gym memberships, post on their Facebook pages, Tweet about it or even pass this on to a journalist. Fitness SF used the press once before to paint themselves as a savior. It's time the truth got out on what they really are. Doesn't it makes you wonder what really drives their publicized "commitment" to the LGBT community? Can somebody who thrives on betrayal in one side of their business be honest in another side? I hope you are with us. Thank you.